Damien Hirst’s wide-ranging practice – installation, sculpture, painting and drawing – has sought to challenge the boundaries between art, science and popular culture. His energy and inventiveness, and his consistently visceral, visually arresting work, has made him a leading artist of his generation. Hirst explores the uncertainty at the core of human experience; love, life, death, loyalty and betrayal through unexpected and unconventional media. Best known for the ‘Natural History’ works, which present animals in vitrines suspended in formaldehyde such as the iconic ‘The Physical Impossibility of Death in the Mind of Someone Living’ (1991) and ‘Mother and Child Divided’ (1993), his works recast fundamental questions concerning the meaning of life and the fragility of biological existence. For Hirst, the vitrine functions as both window and barrier, seducing the viewer into the work visually while providing a minimalist geometry to frame, contain and objectify his subject. In many of the sculptures of the 1990s, such as ‘The Acquired Inability to Escape’ (1991) and ‘The Asthmatic Escaped’ (1992) a human presence was implied through the inclusion of relic-like objects: clothes, cigarettes, ashtrays, tables and chairs. That implied human presence became explicit in ‘Ways of Seeing’ (2000), a vitrine sculpture with a figure of a laboratory technician seated at a desk looking through a microscope. ‘The more celebratory work Hymn’ (2000), a polychrome bronze sculpture, reveals the anatomical musculature and internal organs of the human body on a monumental scale. Hirst is equally renowned for his paintings. These include his ‘Butterfly Paintings’, that consist of actual butterflies suspended in paint, or thousands of butterfly wings arranged in a mandala-like pattern, as seen in the work ‘Amazing Revelations’ (2003). His ‘Spin’ series are made with a machine that centrifugally disperses the paint steadily poured onto a shaped canvas surface, while his ‘Spot’ series have a rigorous grid of uniform sized dots. 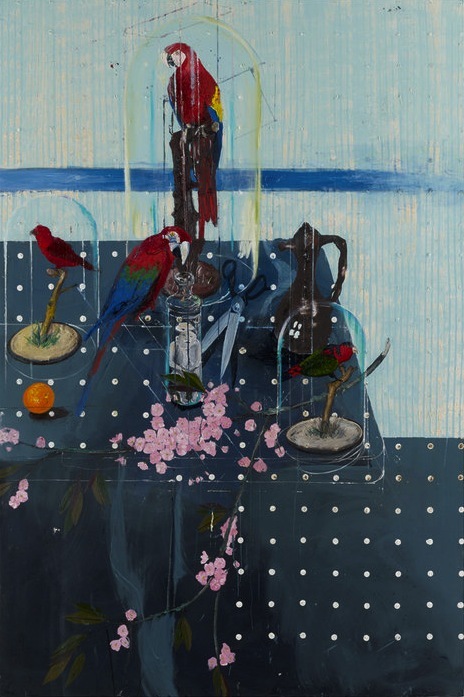 Recently, he has explored photo-realism in the ‘Fact’ paintings. 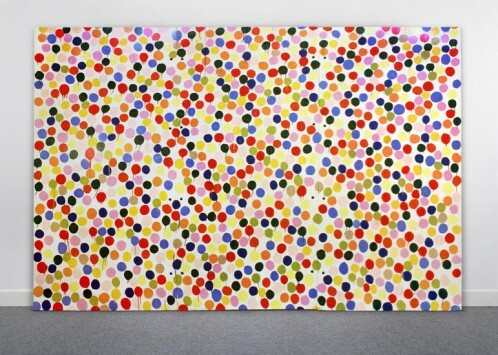 For his first solo exhibition entitled Two Weeks One Summer at White Cube Bermondsey, Damien Hirst presents a series of dynamic new paintings that he started working on in the summer of 2010.